With all models standing up to scrutiny, not much needed to change in our most recent refresh of this sub-$200 article! However, we did add several new models, many of which have seen recent price drops. These included the Behringer Truth B2030A, the Mackie MR6 Mk3, and the Rockville APM8W. Mixing music on a budget? No problem – affordable studio monitors do exist! If you have read our article on the best budget studio monitors, you will be aware of the surprising quality you can find for under $100. However, with two hundred bucks in your pocket, you can find an even greater sense of value. 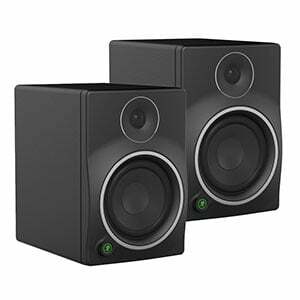 What Can You Expect From a $200 Set of Studio Monitors? Is It Better to Save Up for A More Expensive Set? Pretty awesome balance of performance and power at a very reasonable price. For when you just need that extra volume and massive low end. Tight low end with plenty of features and a really flexible performance. Good transparency, plenty of power and of course, outstanding M-Audio tweeter waveguides. Simple, elegant and packed with enough power for serious every day use. A great alternative that packs features rarely seen in the budget segment . Probably the best member of the CR family of studio monitor speakers . Performance oriented set that offers great transparency at the cost of control. What PreSonus has done with their E4.5, is create a set of active monitor speakers that combine performance, convenience, and raw power. With an incredibly flat response for the money, a whole lot of control options both in terms of tone shaping and acoustics adjustment, and solid hardware, you will be hard pressed to find better monitors in this price range. They are far from the prettiest speakers out there, but PreSonus made that good decision to sacrifice aesthetics in favor of actual performance. Because of that, Eris E4.5 definitely has that sleeper status vibe. Just make sure to properly set up and position them if you want to experience the very best E4.5 has to offer. Rockville may not be the first name that comes to mind when affordable studio monitors are discussed in the open. However, this brand has proven that it is capable of outmaneuvering their competition in some pretty significant ways. What we have here are monitors that pack 250 Watts of power RMS, as well as 8" low-frequency drivers in each cabinet. On top of that, raw performance is not that far behind either. If you are looking for the absolute best bang for the buck, and you have a larger studio, these speakers are something you should absolutely keep in mind. Chances are Rockville's solution may be exactly what you were looking for all along. Behringer Truth B2030A speakers are one of the more interesting monitors in this segment of the market. The design alone will attract anyone who is looking for something slightly different. However, the design is only the beginning. What we have here are bi-amped cabinets with complex acoustic controls and chunky low-frequency drivers. Both cabinets feature two slotted front firing ports that really tighten up that low-end response. Transparent beyond anything we could have expected, Behringer Truth B2030A come across as well balanced for use in home studios. On top of that, you get a lot of versatility in terms of connectivity. Whether or not you're a fan of Behringer, you should definitely check out these monitors. M-Audio’s AV42 speakers were built on an already successful platform that is the AV32 monitors. This time around we get more girth in the hardware, which may not seem like much at first, but really comes to focus when you crank these up. With that said, there are some downsides that maybe could have been avoided. Either way, M-Audio AV42 represent a solid performer that gets the job done and offers a decent amount of transparency. Considering how cheap these are, they definitely deserve a place on any budget monitor short list. If you are just getting into music editing, you definitely need to give these a look. They might be exactly what you are looking for. Mackie is a brand that is best known for their budget solutions in the world of monitor speakers. However, they also have a great series of monitors which are on the very limit of being called affordable. Mackie MR6 Mk3 comes with a beefy set of hardware, including a 6.5" low-frequency driver, and plenty of power to support it all. Mackie has followed the industry standards in terms of acoustic controls, so expect to find both the LF and HF trims available. Overall, you could say that Mackie MR6 Mk3 represents the simpler side of monitoring compared to what is usually found in this price range. Just keep in mind that simple doesn't mean worse or underpowered. Compared to most of their competition, Behringer MS40 studio monitors offer a breath of fresh air. These are active, two-way hybrid near field monitors with an unusual set of hardware. Where most offer 1" tweeters, Behringer offers a 2.5" ones. That type of hardware, combined with a built in EQ section makes for a very different experience. Performance wise, you are looking at a good combination of transparency and versatility. Behringer went with two front firing ports, making that low end tight enough and speaker placement a much easier process. Those who want more control over their sound and have more room on their desktop should really look into these. 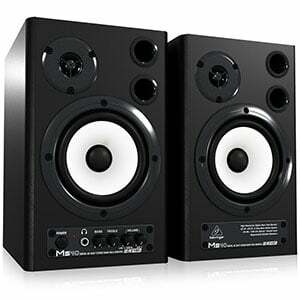 Mackie CR series of studio monitors have been the staple of budget music production for years. Their CR4 studio monitors represent a sweet spot in this family of speakers, offering larger drivers at a price that is highly competitive. The performance is more than acceptable, with a decent level of transparency. On top of that, you get 50 Watts of power split between two cabinets, making these a fairly loud set to use in smaller studios. One thing Mackie CR4 lack are room acoustic controls, however, those features are not really standard at this price. Overall, those who are on a budget but still want to get something above the bare minimum should definitely look into Mackie CR4. Fluid Audio's FA-C5 speakers represent a minimalist approach to affordable monitoring. Instead of trying to make their speakers attractive by loading them up with various features, Fluid Audio opted to invest most of their effort into pure performance. Unfortunately, this is a double edged sword. We love the simplicity and raw sound these boys offer. However, if you are the type of person who requires at least some type of control over your sound, Fluid Audio FA-C5 might come across as underwhelming. At the end of the day, there are numerous pros and few cons to these speakers. They are a bit polarizing, but you definitely won't make a mistake by choosing them over other models. There’s a long-running debate in the music production community over whether or not it is acceptable to use budget monitors for mixing music. There are those people who demand that nothing short of a high-end set will do, while another camp (hint: a camp we are part of) believes that you can definitely make some great stuff on affordable speakers. Of course, there are some things an affordable monitor won’t be able to offer – premium design and build, thumping power and the flattest tones, for example. Still, mixing music without monitors is much worse than going with a cheap set! When it comes to what you can get for around $200, the choices available are pretty decent. This segment of the market is where we start to see larger drivers as standard, while more advanced controls are also available depending on the model. The most important metric is still going to be performance or, to be more specific, the transparency of the speakers in question. In this regard, the monitors available in this price range are going to offer a very decent performance. Perfectly flat? Probably not – although certainly ample for beginners and use in home studios. Ultimately, this kind of speaker is going to offer great convenience. They will be compact, lightweight, active in nature and fairly powerful, meaning you won’t need any additional equipment such as amplifiers to get them up and running. Budgets are completely different depending on the person. For some people, $500 is classed as affordable, while for others a set of $500 speakers would require months of saving. As music production is a skill you develop over time, we always believe it is better to buy an affordable pair of speakers if that is all you can afford – it is better to have affordable speakers than no speakers at all! While $200 speakers have some shortcomings, this chart will have proved they are very worthwhile for producing music. However, to make sure you get the best from these speakers, it is worth considering how you position them. The simplest rule of speaker positioning is that symmetry is key. Form an equidistant triangle between yourself and the speakers (the speakers form two points of the triangle while you form the third). With this setup, ensure that the speakers are level with your head (which might require you to use dedicated stands in some situations) and that the high-frequency tweeters are shooting straight towards you. As you probably know by now (because we have really drilled it into you! ), buying a set of studio monitors for under $200 will get you reasonable performance without damaging your bank account. Of course, there are still a few duds in this price range, but follow the recommendations in the chart above and you will end up with something well worthy of your time and cash. Don’t rush into a purchase – read reviews, watch videos and, if possible, sample some of the speakers on your shortlist. Good luck!